Few managers would disagree that productivity is one of the cornerstones of any successful business. As such, many of these managers invest heavily in training schemes, bonuses and any other method to extract as much productivity from their employees. Something that often goes unnoticed, perhaps unsurprisingly, are window blinds. 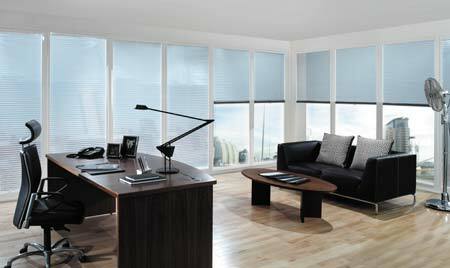 While some readers may scoff at the suggestion, advancements in this industry means that blinds can very much be one of the core components when it comes to improving the overall productivity levels of an office. Let’s take a few examples. For years and years screen glare has been a huge moaning point – and this isn’t just for office workers, with anybody who has ever set eyes on a television in the sun completely understanding what we’re talking about. Unfortunately, when it does come to the typical office, such sun glare isn’t just a nuisance – it’s something which can hinder even the most work-conscious person. Therefore, a solution was required. Some companies may have shut all natural light out through thick and ugly curtains and in fairness, this would have solved the issue. Unfortunately, it would have also shut out all forms of natural light and as any productivity-conscious person will tell you, this is another cornerstone of a successful office. Fortunately, blinds companies have reacted and released solar shades – blinds which block out the powerful light which blights our eyes, but still allow about 30% through so our office isn’t cast into darkness. Next, we’re onto the issue of security. While this won’t directly affect employee productivity, the methods that some companies use to get around the issue certainly will. Again, a lot just decide to block out the windows and as well as preventing prying eyes from peeking through, it also stops that elusive natural light from entering the room. Once more, a solution has been formed via a window treatment – with top-down bottom-up shades being one solution. As the name suggests, these can be operated from both the top and base of the window, allowing for a much greater degree of flexibility in relation to the portion of the window which is shown. It means that companies can block out the lower portion of the glazing, and prevent the prying eyes, but still allow sunlight to gaze through the upper region. It’s possible to be even more creative with the treatments and when one happens to work in an office environment which just can’t be set to a comfortable temperature, blinds also have an answer. It could be with the solar shade, which controls heat as well as light filtering, or something like an insulated shade which can “lock” heat into a room when the colder temperatures hit the country. In summary, effective window treatments can solve umpteen issues that hinder the typical office worker. It means that rather being something that was just regarded as decoration, blinds can now be considered an investment that any successful business should look towards.